The Incredible True Story of America’s Top Underdog. 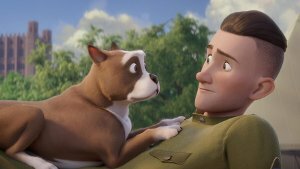 Set during World War I, we follow a little dog who wanders into a US army training camp, and is adopted by one of the soldiers. The pair later ship off to France, where they hook up with a French soldier as they endure the war against Germany. The dog displays frequent acts of courage, and is eventually rewarded by being promoted to sergeant, the first dog ever to achieve that rank. Adventure, Animated, Family, Period piece, War. Are you sure about that haircut? Violence Fairly frequent, low to mild impact, fantastical context, contains no blood-letting. 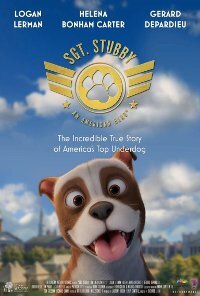 Comments Light-hearted animated themes following a true story of unlikely heroism of a dog venturing into military life. The themes explore courage, recognition of will, determination, bravery and wit, rejection and acceptance, teamwork, friendships, army training, loyalty, acceptance, togetherness and serving one's country with pride presented in a an unrealistic, fantastical and cartoonist style that carries a low sense of threat and menace, however this may potentially lead to the arousal of fear to the younger viewers. Also, although fantastical, younger viewers might still not have the ability to distinguish between what is realistic and unrealistic. The themes however carry positive, historical and educational messages which younger viewers might benefit from, the theme of world war I is treated sensitively and the events are presented in a animation format which helps mitigate the impact as compared to when presented realistically, therefore it is quite clear that the intention of the film is for younger viewers to learn about this heroic dog that served America and became everyone's hero. A 7-9PG rating would therefore, be suitable as parental guidance would assist younger viewers in recognising the context and providing reassurance.